Ever been tempted to pray for patience? I have. Then I learned my lesson. I’m not kidding. Don’t ever, ever, pray for patience! Many times in my life I have been in the midst of turmoil and yes, there were moments that I needed a bit of something to get me through one more day, but deep down I knew that what I needed was patience. Dare I ask God to give it to me? I needed it . . . but dare I ask for it? I am a firm believer that God will give us any righteous desire of our hearts if we are willing to do the work to make it happen. This is not always true, but as a general rule, He will give us whatever we want that will better ourselves. I believe that patience lands in this category. Wouldn’t the world be a better place if we all had a bit more patience? How much road rage would dissipate? How many pregnant moms in their last month would enjoy having the miracle growing inside them? Or for me, right now, I am quite impatient to see how my cover of Inspired by Grace is going to look! Here is a sneak peek at the photo we are using. It has only been two weeks since we had the photo shoot but I can’t wait to see how it will be transformed into a beautiful cover! Truth is there are some things I have learned over the years when it comes to patience. First of all, patience is not passive. We sometimes think of a patient person as someone who sits and waits. Wrong. Patience requires active effort, everyday! There is nothing passive about it! A patient person does not simply smile and nod as the world moves around them, they are working hard at it, sometimes harder than one who is impatient! For example, isn’t it the truth that when you really need to be somewhere on time, that is when you hit each and every stop light? And the adorable, but too slow, red VW Bug with its top down carrying a sunglass-sporting blonde chatting on the phone you just passed also gets stopped at each one? She looks like she enjoying the first day of spring far too much when you will be late for work! She doesn’t even seem to notice that she is being stopped at every light. But you have nearly counted them and as you punch the gas to get passed that irritating representation of everything you wish you had right now, you get stopped again, and she rolls up next to you just in time for it to turn green. Being impatient is exhausting! But looking at Miss Relaxed-and-going-with-the-flow gal in the red VW Bug makes you frustrated. In the end, you both get to your destination at the same time. But you have just suffered for 12 ½ lights (you finally ran through the last one which you claim was still yellow but we know how it was . . .). My point? It takes an active effort to be patient! There is nothing passive about choosing to be patient. It is a choice! Just like being impatient is a choice! Another truth about patience is that it is about enduring. Let me tell you a story. I usually run for about 2 ½ miles and one day I took a new path. I had no idea how long I had run but I had my running app that told me every once in a while how far I had gone. One day I took off and turned my music on and prayed while I ran. I was struggling with things in my life and I didn’t know if I could see solutions anytime in the near future. How would I solve the problems? Suddenly my app tells me I have run 2 miles. I had no idea how far I had run since I never mapped it out so I didn’t know when the approximate turnaround point should have been. I made it a few more blocks and started heading home. But I had over 2 miles left before I reached home. Was it possible? I had never ever run 4 miles before and I was a little worried. Here was the answer that came to me. “Head in the right direction and put one foot in front of the other and you will make it home.” I understood that not only did it apply to my excessively long run I ended up on, but it was the answer to my problem I had been praying about! All I had to do was endure it and keep moving in the right direction and I would make it to my goal. It just required a bit of patience. And in this sense, that meant I had to actively (one foot in front of the other) endure (head in the right direction and not veer away from the goal) with patience. But why choose patience? It is about joy in the journey. Impatience has its consequence but patience has a far better reward. We do not always have answers to our problems but as long as we keep putting one foot in front of the other, we will arrive home. And we will look back at our run with pride and see the growth in our hearts. So whether or not it is being patient with ourselves or with others, choose patience. I know that good things come to those that actively wait and endure. In the mean time, while we wait for an official cover reveal of my original Regency romance, Inspired by Grace due out in May, (which I was hoping to do with this blog post) I will instead have a giveaway of Mr. Darcy’s Promise. To make you excited for this giveaway, here is a short excerpt about patience in that book. Good heavens! If she only knew how badly I wanted to take her in my arms! But he could not. Time, he reminded himself again, must be his mantra. Care as she might for him (and he was certain, now, that she did, at least a little), her unwillingness to mention last night’s kiss was a sign that he needed to wait a little longer. Although his body protested that he had already heavily taxed his resources of patience before they had first kissed. How would he manage to moderate his desires? Hope you liked the excerpt! I will give away a copy of Mr. Darcy’s Promise, Second Edition, to one lucky commenter! The winner can choose either paperback (U.S. only) or an eBook (internationally). Tell me what you think of the post, or tell me what you think of the photo we are using for the cover of Inspired by Grace! Either way, COMMENT! Cheers! Good luck in the giveaway! Ah patience… taking time to reflect on life’s issues or simply slowing down to enjoy your surrounding. There’s a saying “Be careful what you wish for” as things do not always come out as you expected it or as soon as you want it to. Beautiful photo and background. Love the color and the pattern of the dress as well! That photo exudes patience! Great choice. I was counseled a long time ago to not pray for patience! I do my best to manage with the amount the Good Lord has already graced me with. ; ) I loved this statement: “Impatience has its consequence but patience has a far better reward.” So very true! I think it is so funny how many people don’t pray for patience! It is so common that it makes me laugh. Shows just how much faith we all have in letting God grant us our prayers!!! Ha ha. Good quote. I love it! I think that the pic is great, very interesting and I love the dress she’s in! Ah yes, the dreaded praying for patience! I’ve done that a few times in my life, and while I suppose I should say the results were worth the stressful journey, I’m not so sure. LOL! I love your blog posts, Jeanna. Such real life advice and truisms. Thanks for sharing your insights with us. And, the photo is FABULOUS! I am quite sure the cover will be stunning. Can’t wait to see it!! Thank you Sharon! I just wait until something moves me to write a blog post. Can’t say it is ever easy to be a “truest” but I do try. I think honesty and realism is by far much more rewarding. 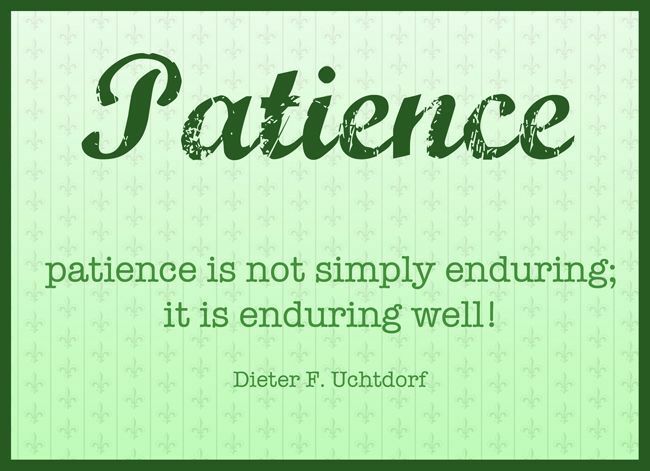 I think many of us have prayed for patience and been “rewarded”. Years later we have the hindsight to say it was worth it but it is no fun during the wait! Thank you about the photo comment! I cannot wait to see it come about. I got a quick look at the rough draft and I am flabbergasted at how artistic this artist is! I just about dropped my jaw and actually gasped! I hope everyone else does too! You are so right! I have a hard time with patience too. I never understood the word longsuffering very well, but lately, I’ve started to see it as a form of patience. Sometimes, especially as a mom, I just have to wait and wait and still stay positive and hopeful. That is patience and longsuffering. You hit it on the head! Stay positive and hopeful! I should have put that in the blog post! I feel like optimism is contagious not only others but ourselves. Once we start thinking positive and thanking God for all He has given us, it comes easier the next time. And moms have to be sooooo patient! If the kids only knew how hard we try! Right? Patience – it’s actually one of the few virtues I can claim without hesitation. It’s a trait that has blessed me in many ways, but has also made me prone to procrastination, which is not a positive attribute to own. My dad used say that he prayed for patience once, and it went something like this: “Dear Lord, please give me patience … and give it to me now!” Of course he was joking, but it was a great illustration to me of the futility of praying for patience. Now I’ll patiently wait for your cover reveal. It is so refreshing to hear that patience comes naturally to some people! Way to go! Definitely be grateful for that. But I do see how that could pose a problem with procrastination. I love the quote your dad said. That is me to a tee! Love it love it love it! Might have to use it! Jeanna, Thank you. Patience is so hard to master. I find I am very patient with most people but if I had to do it all over again, I would not be so quick to rush to my daughter’s rescue. Why is it that it is so much easier to step up and take over when our children can’t tackle a task? I must keep telling myself, you are not helping her. Thank your for the subtle reminder. My children are very young still but I’m glad I’m not the only one who strugges with this. On the flip side, when I do make myself stand back and let them do things (while mentally hovering with an OMG!! This is all going to go wrong and fall apart any second now. How fast can I fix this and/or the rescue squad get here expression upon my face) people look at me like I’m irresponsible. It’s *those* people I’m tempted to lose my patience with. That is a hard one! Making my children do it themselves is not something I personally struggle with though. Perhaps it is easier and quicker to just do it ourselves, but I do try to teach them what they need to know. The only thing I do not do this in is cooking. I just enjoy it so much and cook like my mom (A pinch of this, a dash of that) that they get frustrated when they do not have exact recipes to follow. I’m not perfect, I suppose. You certainly targeted me Jeanna! I am a type-A personality and I have absolutely no patience, which has gotten me heart problems over the years. Thank you for the reminders of what does not work and what does. 🙂 BTW I love the cover photo! Another of your lovely daughters! I’m so glad you liked the cover photo! I am thrilled with how it turned out! Yes, this is my oldest daughter. The main character, Grace, is based largely on Paige. So it is fitting that she is on the cover too! Us type A personalities get a lot done in a short amount of time. I rarely sit and just think. I hate driving long distances unless I have a book on tape because I have to be productive, right? Mark something off, be productive! Contribute something! I have to stop and remind myself that “be still” is a very good trait to learn. Heard a great take on a favorite scripture. The actual scripture is “Be still, and know that I am God.” But my friend said it this way, “Know that I am God and be still.” I was so impressed with the image that I wrote the quote down and put it on my mirror. I need to remember that my testimony and faith in God is the exact thing that will bring me stillness. I need to put my effort into maintaining that faith. Having Patience can be a struggle at times, because she is a 16’3H, 1500 pound horse with a warped sense of humor! I like the idea of having patience until I reach imperturbability. As a fellow ginger, I really like the picture of Grace. My mom was a single mother of 4 kids. I recall one time her telling a friend “I pray for patience all the time!” The friend replied, “No! Never do that! The Lord will just give you tests to gain it then!” As I struggled with my two kids in the grocery store yesterday (we left before I finished and I still dont even know if I have enough for a meal tonight) I was reminded of that. Intead of praying for patience, I just put one foot in front of the other and tried to keep my calm and endure the day. It didn’t get better, but I survived and today is a new day. Thanks for a lovely post reminding use to endure! I already have a copy, but good luck to all the others who enter! It’s a wonderful story (one of my favorites!). There is not a young mother out there who has not abandoned her cart and just left the store! Sometimes that is far better choice! Good job! Hope you were able to scrounge up something edible. I hate those nights when all you see is nothing in your cupboard. but I bet if you posted six ingredients on Facebook, someone would come up with something great to eat! Ha Ha. I am so glad you liked Mr. Darcy’s Promise! It was my first one I wrote and am very proud of it. Cheers! Great post. Patience has always been a struggle for me. I like the photo as well. Your giveaway is my one of my favorite books. I would love to have the paperback! Yay! Glad you liked it and glad it is one of your favorites! I am humbled by such a comment because here on Austen Authors I am rubbing shoulders with the best! It still surprises me that people like my writing. I know, I’ve published 3 books, with excellent sales, and I still am a amazed that more than my family bought them. Every time I get a review, it is like Christmas! This is the second edition, so hopefully you will win it! Good luck! I’ve never prayed for patience because my preacher father used to preach sermons on not praying for patience and I SURE didn’t want to be tested like that. LOL I have prayed for the ability to let go and follow which, in my opinion, goes along with patience. What God has in mind is not always fast or obvious so just let go and follow. Funny how NOT praying for patience is not some novel idea. I can imagine how a preacher might have lengthy discussion on the topic! I like the idea of letting go and following where the path leads. I do love to go on walks and explore places. I will have to associate that with life. If i let go tf knowing the destination, perhaps I will be pleasantly surprised in the journey! Sometimes it is “The blessing of unanswered prayers”. And I have found that sometimes I have to wait a long time (a year) to understand just why the answer was “No” or something for which I did not ask. “Give me patience and give it to me now” is an old joke! The cover is lovely. Looking forward to you next book as I have read the others. Thanks for sharing. So glad you like the cover. Lovely is a good description. I remember seeing the photo for the first time and I sighed. My daughter is so beautiful.. I actually said out loud, “I can’t believe I made her!” Ha ha. So it was a proud mamma moment. Yes, I do know of the Garth Brooks song and that is exactly where the phrase came from. I am always grateful for my three adult children..and, of course, we mothers think our children AND our grandchildren are beautiful. I forgot you read the unedited version! She does look like her! Ha ha. Glad my description in the book matches the model the character was based on! Ha ha. You are right, as a nurse, I find it is a bit easier to be patient. It is hard to see a patient hurting and they can get pretty demanding of me but it is all understandable. I think God gives us just the right gifts to do what we need. Even young mothers are given the patience to endure sleepless nights or the constant need to fight with their brother. Whatever it is, an outsider stepping in, simply could not handle what they do on a day to day basis and that is something to recognize and celebrate! I think the cover will be absolutely beautiful. I love the outfit and the stone arch behind the model. Is the model one of your daughters? I agree that patience can be very difficult to attain. Working with a class of 18 4 year olds I need all the patience I can get & very often I don’t have enough after 8 hours in the room with them and another 2 hours to go. I am always praying for more. As well as after telling them the same thing 25 times that day and it’s not even half over. Yes, patience is endurance. Thank you for generous giveaway, Jeanna. Thanks Debbie! I found a seamstress on Etsy and I picked out and bought the fabric and sent it to her, She only charged me 115$ to make it. I just sent her the measurements and I was so pleased with how it turned out! I bet that teaching 4 years olds will definitely try your patience! I work in a neuro ICU and find that sometimes it is a little easier to be patient with the patients because they can’t be held responsible for what they do since they are inured. I suspect it is the same for children that young. It doesn’t mean it is not exhausting though!